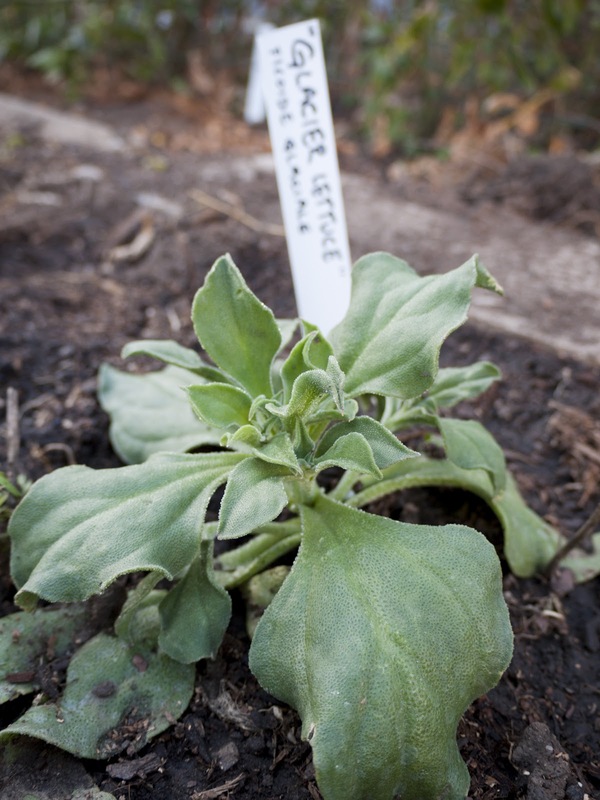 Just FYI: you don't have to wait until spring to plant your garden. (At least, not if you live in this climate.) 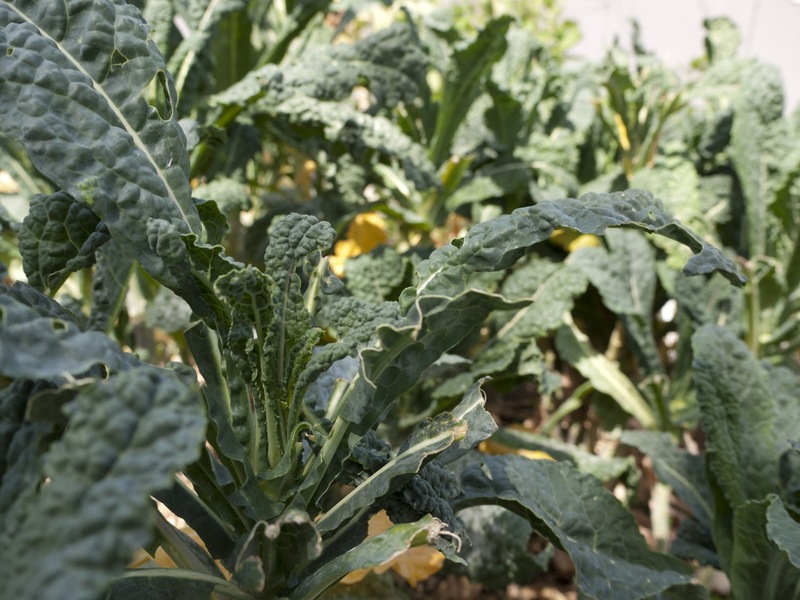 Right now is a great time to plant cool-weather edibles. The back of the western veggie bed is all greens. So far, we've got six kinds of lettuce, two kinds of spinach, assorted spicy micro-greens, mâche, and two new ones: miner's lettuce and glacier lettuce. 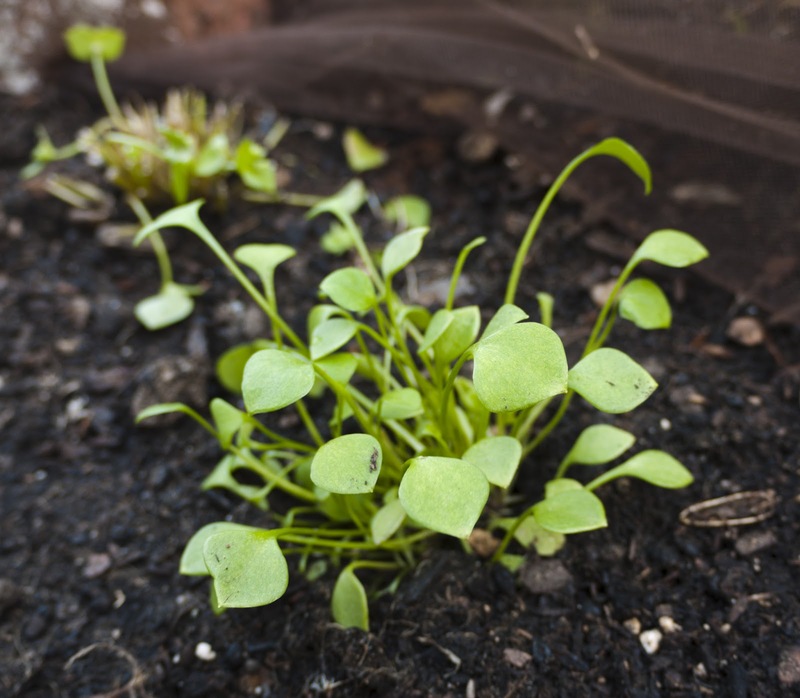 The miner's lettuce, tucked back behind the kale, is a CA native with a fondness for some shade and good moisture. Word has it you can still find it growing wild. Apparently, the gold miners ate it to prevent scurvy. I tossed my first harvest with pasta, topped it with garden tomatoes and some fresh ricotta, and am pleased to report that I am still scurvy-free. Glacier lettuce (aka ficoide glaciale or ice lettuce, but totally different from iceberg lettuce) likes it a little drier, so it's planted next to the driveway (right behind the carrots). It's a South African plant, described as having "melt-in-your-mouth texture with crunchy, juicy, refreshing flavor and a hint of lemon and salt. Highly sought after by chefs." Fall is also great for the more robust greens. Our kale patch is still going strong, but I'll probably put some chard in soon. Peas love the cooler fall temperatures, and I love peas. I've got a row of "Taichung 13" variety edible podded sugar peas planted under the left-hand trellis, and I'll be planting more of my beloved "Laxton's Progress #9" once the tomatoes have finished up. 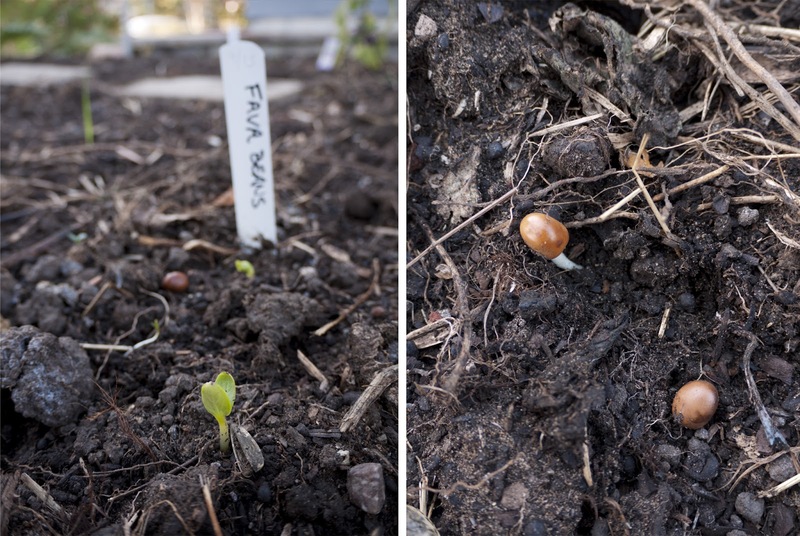 I've also planted two sets of fava beans: a small stand behind the black tomatoes and a larger patch in the center of the left-hand veggie bed. The latter was intended as a cover crop, which you're theoretically supposed to plow back into the ground before it flowers, to enrich the soil. On the other hand, fava beans are very delicious, so if they do well I may just let them go to harvest and give the soil an extra-large helping of compost. This is the season to plant garlic and onions. I'd already tried two sowings of onion seeds and got bupkis, so I picked up 3 six-packs of onions from the nursery: Torpedos, Walla Wallas, and "Hamburger" onions. There are a lot of little green onions in each six-pack cell, so now I've got onions planted absolutely everywhere. Maybe they'll help repel pests or something. I also picked up a few varieties of garlic, which will go in sometime this week. Berkeley Hort didn't have any of this black garlic I've been hearing so much about: anyone know where to get it? If you do, please drop an email to claire (at) hivequeen (dot) com, leave a comment here, or just leave a few cloves on the bench in my driveway. Labels: chard, fall, fava beans, garden, glacier lettuce, lettuce, miner's lettuce, spinach, What's that plant?